Youjoomla develops professional Joomla Templates, Joomla Extensions, CSS Templates and WordPress Themes. Youjoomla Joomla Templates Club allows you to download and use all Existing Joomla templates and all future joomla template released during your membership period, including all PSD and additional source files. 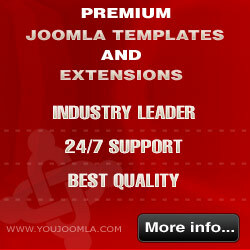 You can download and use all Youjoomla Club Extensions based upon your membership license. You will also get unlimited Members Only Support Forums access.